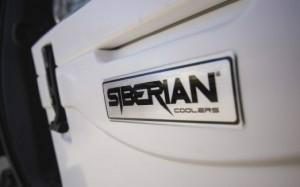 We are almost sure that the majority of you didn’t hear anything neither about Siberia nor about Siberian brand of coolers. So, we are going to make a small introduction for you. Siberia is the big part of the Russia and is known as a part of Northern Asia. The main peculiarity of this region is its incredibly low temperatures in winter, for our opinion it is more than just successful name for coolers’ brand. What about Siberian coolers? 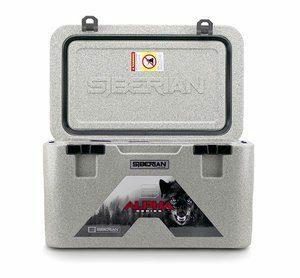 Everyone of us heard about such famous coolers brands as Pelican or, for example, Yeti, but actually there are a lot of other coolers brands which are not so popular but also have very good characteristics! Coolers that will be described in the current review are one of such representatives of very good but unfortunately not popular enough. Are you intrigued? Let’s starrrrt! So, let’s consider in details why did Siberian coolers conquer our hearts? Perfect results. Yeah, it’s not just an exaggeration, these coolers have shown themselves as the real cold monsters. Our team decided to make a special challenge for these coolers line at the summer of 2017 year and what did we see? At the temperature more than 90° above zero (! not bad challenge for coolers, yeah?) these strong guys managed to save ice inside during more than a week! It’s really perfect result. The result can be seen at the picture below where we showed you the two coolers (Siberian and Yeti) after fifth day of challenge. The exact term for Siberian coolers was eight days while other coolers at the similar challenges didn’t stand even a week. So, you see that result is good, and the main thing is that it is at the AFFORDABLE price. This theme deserves a separate paragraph. Attractive Price. Price point of this line of coolers will not leave you indifferent. Actually we got used to the high prices of Engel and especially Yeti coolers and it’s a common opinion that “the pricier means better”, but believe us, it’s not true. The one of the main reasons of high price of previously mentioned coolers is their brand. They are famous, they have a lot of good reviews, so why purchasing them you can be sure that you are buying good product. The one more thing about such famous coolers is that their offers do not always coincide with the results in real life. 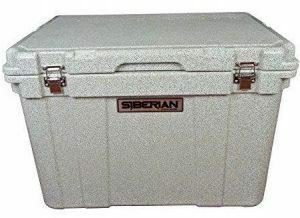 For example you will get the eighty –seven quarts cooler instead of one hundred and ten – quarts in the case of purchasing Yeti 110 model. We don’t want to say anything bad about other brands but it is a fact. And also it is a fact that in case of Siberian coolers you will get exactly what you expect to get. And of course at the affordable price. 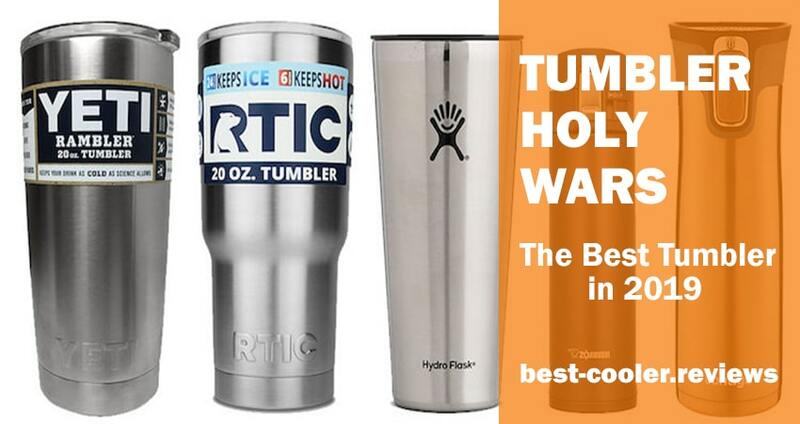 Best coolers for the family use. Why do these coolers deserve such title? 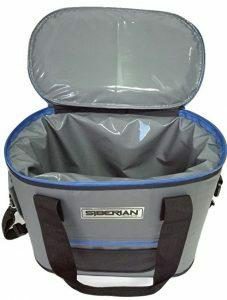 We decided that this line of coolers suit very good to the family use because firstly they have very reasonable price, secondly you can go camping for more than a week and be sure that these guys will not let you down and thirdly you will always get exactly what you expect to get. 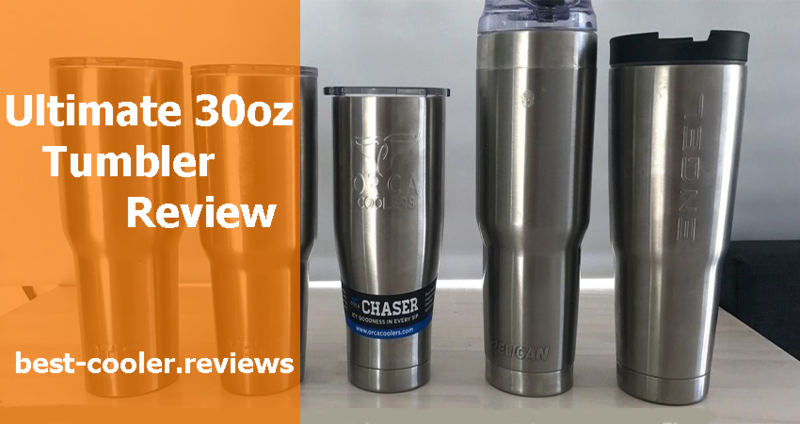 After many researches these coolers have shown unexpectedly good results and they were even better than some of Grizzly or even Yeti options. Which cooler is the coolest? Let’s check Siberian and Yeti options. The first you thought will be “come on, guys, how can you compare these two brands!” but we prepared the video that will surprise you a lot. Here you can see that both these coolers have differences in their construction and the main thing …their ice holding features. The Siberian model shown in this video has better result than Yeti one. Not bad, yeah? 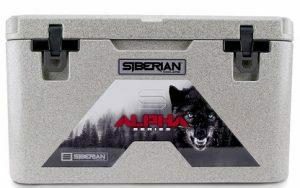 Moreover, nowadays Siberian manufacturer created the new model and called it new Alpha. This option can show even more astonishing results than all others Siberian ice chests available now! 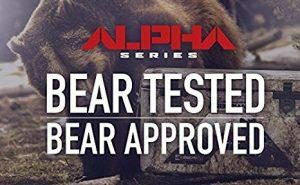 The newest technologies of coolers are implemented in the Alpha series of Siberian coolers. This line is available in several different sizes and you can also choose it in the white or dark grey colors. The main distinctive feature that makes these coolers unique among all other options available nowadays is their special system that is called “cam latch”. The first cool feature of these latches is that they are made from super-durable fiber reinforced thermoplastic and aluminum that will protect your cooler from all types of corrosion and other damages. Current series also use special Styrofoam for external layer isolation. One more great feature that these new coolers can boast of is the special holes for padlock that are hidden and integrated into the rotationally molding very popular nowadays structure. 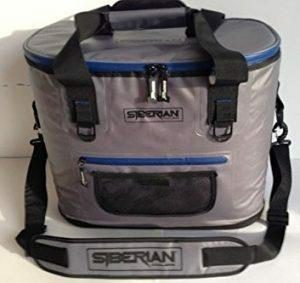 This soft and at the same time very tough Siberian cooler bag was created specially for those, who don’t like bulky and heavy ice chests. This bag is made of the special antiskid material while the inner part of this bag is made of the High Temperature Polyurethane that is waterproof and extremely durable. Seams of current cooler bag are also waterproof so you don’t have to worry about the safety of the content of your cooler. The bag is also equipped with the outer pockets for the integral and very necessary trifles such as cellphone, money, opener for bottles, keys and a lot of other things that always should be at hand. 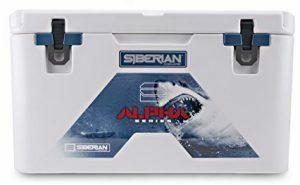 This cooler has size equal to 18 x 10 x 14 and it means that you are able to put in it up to thirty cans with twelve ounce capacity of each. Also for your convenience manufacturer added durable shoulder strap for easy carrying even when this bag is fulfilled with cans. For more information about various soft coolers we recommend you to check this article: Best review about Modern Soft-Sided Coolers . And one more very important thing is that it is highly recommended to check the availability of such cooler soft bag in our stock. 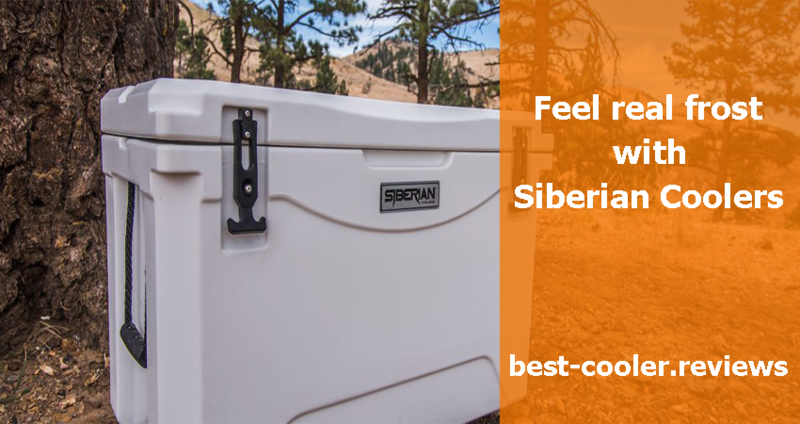 This line of Siberian coolers offers you their simplified a bit and because they are not manufactured anymore as a rule you can purchase these coolers with the good discount. This line was the predecessor of above mentioned Alpha line of Siberian ice chests (see the picture below). 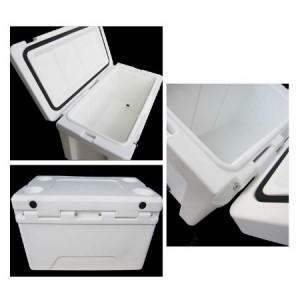 Outback line of coolers can provide you with the special nonslip feet and hinges made of the durable steel. The one of the most amazing things offered by this manufacturer is the permanent warranty for all their products. Weight of this option is twenty four pounds when the cooler is empty. Strong body and good price (you can find it at around three hundred dollars) make this line still very popular among users. This line of coolers has also been substituted by Alpha series described before. Nowadays you can purchase these models at a very good price because they are not produced anymore. 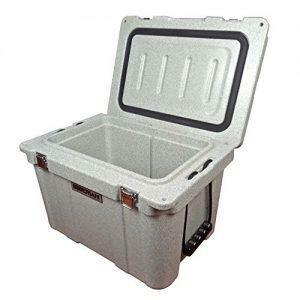 These ice chests are available in the dark grey and white colors and will please you with almost three inches of insulation. Such great insulation level is one of the main reasons why these options are among the best models when to talk about duration of ice retention period. The capacity of this chest is eighty five quarts (by the way the same capacity you can also find among coolers from the Alpha line).